"When you obtain the knowledge of Ryukyu Kempo, do not let it go to the back of your head and force your nose up. Instead, let the knowledge that you learn come to the front of your head so that you will always keep your head low with humility and respect." 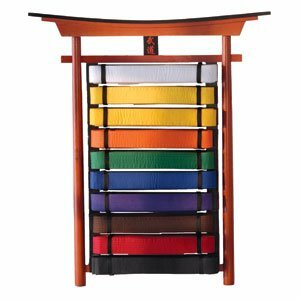 One explanation for the colored belts is the notion that the belts simply went from white to black because the original Karate founders never washed their belts. They started off with white belts and after years of training ended up with black belts. The proponents of this legend assert that the belt, which was initially white, gets gradually dirtier and dirtier and so goes from white to yellow to green to brown to black in that way. Achieving your first black belt is a great accomplishment and something to be proud of, however it is not the end of the journey. The black belt is just the beginning of the path to understanding and developing your karate skill. We like to compare getting your black belt to getting your drivers license...it is something you earn so that you can use it and your driving (and your martial arts) will continue to improve as the years progress, with consistent practice. 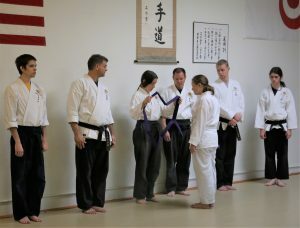 All our black belts are supported in continuing their training and working towards their next rank, while giving back and to the art and deepening their understanding through teaching.